Decatur's only FULL SERVICE Pro Shop! We're located in a bowling center and we're staffed by three Hall Of Fame Bowlers! 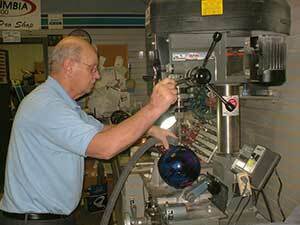 We offer a complete line of bowling balls, bags and shoes. We also stock the most often asked for bowling supplies. We also are are proud of the fact that 3 Hall Of Fame bowlers are available to meet your needs: Tom Adcock, Rob Baser and Harry Logan are on staff and available to assist you. Hall Of Fame Member "Big Ern"
is retired now after over 40 years in the bowling industry. He'll be remembered by the Decatur bowling community for a long time!